We use our own protocol to perform micro-needling in conjunction with PRP (Platelet Rich Plasma). 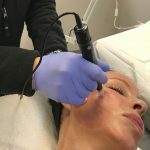 When Micro-needling is combined with the power of your body’s own natural platelet-rich plasma (PRP), the procedure stimulates your bodies natural healing process and stimulates collagen in the skin. We combine our experience and expertise with the additive rejuvenating effect of these two procedures in order to achieve the best outcome. Skin texture, color and tone. Micro-needling with PRP is available to almost anyone because it is a natural procedure with minimal side effects. It is ideal for candidates with darker skin as well. PRP is blood plasma containing highly-concentrated platelets. Platelets are a specialized type of blood cell involved in healing. Platelets contain several different growth factors and other cytokines that can stimulate healing of soft tissue. PRP treatments are performed by drawing these components from a patient’s own blood, separating the plasma from the harvested blood, then using the PRP as the slip to microneedle into the patient’s tissue. Yes. In fact, we recommend repeating the treatment three times over the course of several months. We will instruct you regarding how to take care of your skin in-between treatments so that you can achieve optimal final results.